Hi there! Welcome to my new blog series, Clueless Cook, in which I, Francesca, try to cook food that isn't 99 cent Rice-A-Roni (or it might be, who knows). Clueless Cook will detail all of the trials and tribulations I face while trying to make extremely simple recipes. My dad is a chef and my mom can make really great pancakes from a box. Guess where my (extremely limited) skills come from? Today's meal was a dinner I made for myself last Friday. I can guarantee that it was not difficult because I—well—because I could make it without any trouble at all! 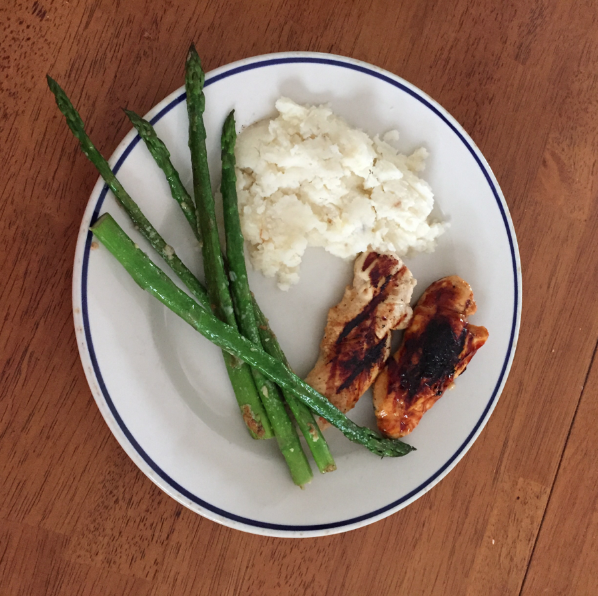 It's just marinated grilled chicken, asparagus, and some mashed potatoes (there was a an unpictured salad as well, but those are pretty self-explanatory). 1. Make sure your hands and chicken are clean. Dice off any leftover fat pieces and put them to the side. 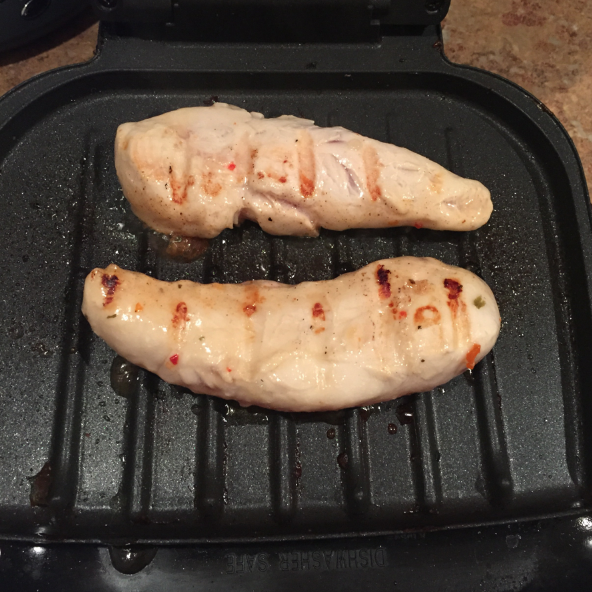 Poke holes in the chicken with the tip of your knife. 2. Marinate chicken in the Italian dressing (raspberry vinaigrette, BBQ sauce, or oil with salt and pepper are three other viable options) the night before or the morning you plan on cooking it. 3. 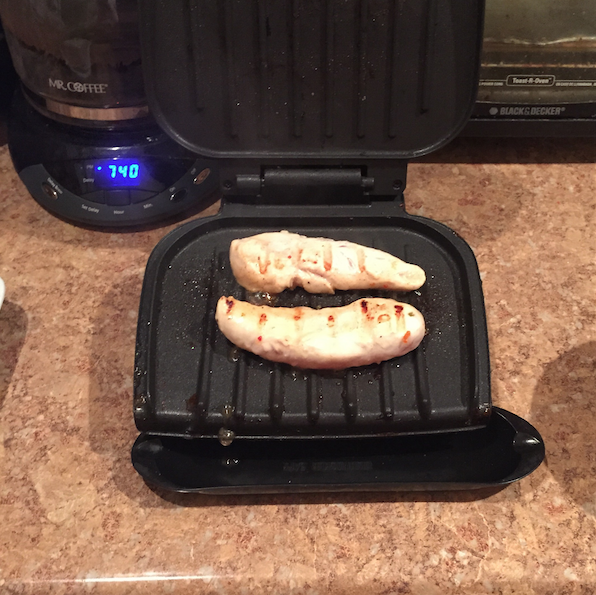 When you are ready to cook the chicken, plug in your George Foreman grill and make sure that it is clean from previous uses/dust/etc. 4. Place your slices of chicken on the grill and press down the lid, leaving the chicken cooking for six minutes (no longer than seven). I usually flip mine halfway through so that both sides get evenly cooked and doesn't look deceivingly finished when it's not. 1. 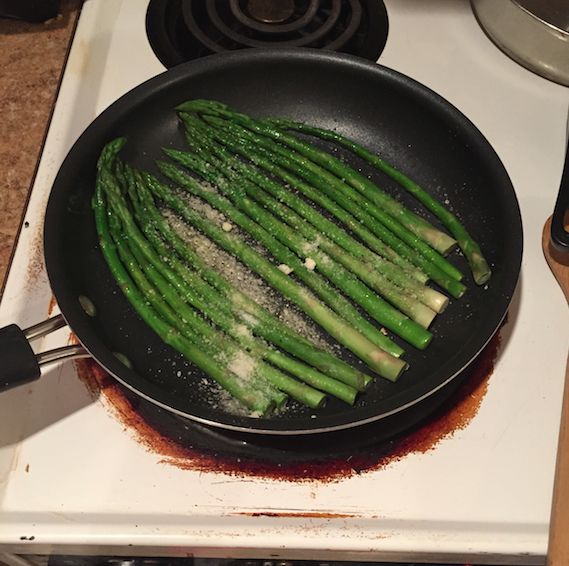 Put your asparagus and some water into a skillet. Cover your skillet to that the asparagus can blanch for about three to five minutes. 2. Add a very minimal amount (about a tablespoon) of olive oil into the drained skillet. Add your seasoning and cook until it loses its firmness. Microwave your mashed potatoes for as long as you see fit and put everything on your plate. If you're REALLY feeling crafty and Gordon Ramsay-esque, go on and make your own homemade mashed potatoes. I couldn't tell you how to do so, but I'm sure Pinterest have more than enough potato recipes to go around. These "recipes" are never going to be anything special or spectacular. These are real and simple meals that I, a very clueless cook indeed, can make on my own. If you're like me and can barely manage to not screw up pasta with butter, I hope you find this series helpful. If you can cook...I hate you and I am so beyond envious of your skills. I'm kidding. I love you, come help me as I navigate my way through a kitchen for the rest of my life. What's your favorite thing to make? If you can't cook (like me! ), what would be the first thing you'd make if you could?